이제 2019년도네요! 새해 복 많이 받으세요 여러분! 2019년도는 완전 새로운 시리즈로 시작해보려고 합니다 - 바로, 한국 먹방 투어 상급코스!! 이제 한국에서 생활한지도 어느덧 1년이 넘은, 웨일즈 사람인 척 하는 한국 아재 단앤조엘과 함께 다시 만났답니다! 같이 맛집을 찾아다니며 그 지역만의 특별한 먹거리를 먹으며 한국 문화를 여느때보다 더더욱 깊이 음미해보기 위해~!! It's 2019! Happy New Year! And we're starting 2019 with a brand new series - the Advanced Course Korean Mukbang Tour!! 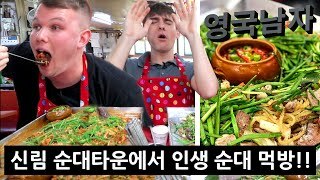 We reunite with the Dan, the Korean a jussi in Welshman disguise, and Joel after they've been living in Korea for a year, to learn from their experience, and dive deeper than ever together into the world of Korean mat jibs and local specialty delicacies!